In a blender combine oil, soy sauce, shallots, garlic, lime juice, cayenne, cumin, and honey then process until it becomes a smooth liquid. Place in a zip lock bag together with your skirt steak, let it marinate in room temperature for 2 hours. Prepare a very hot grill pan, make sure it smokes even before using them. 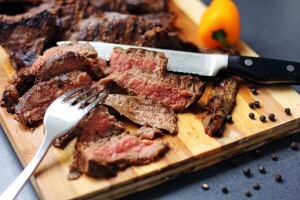 Remove the skirt steak from the zip log bag, drain and pat it dry with heavy paper towels. It should be totally dry before you drop it on that hot grill. Now place your steak on the grill then still on high heat cook steaks for 1-3 minutes on each side. 1 to 1½ minutes would be rare and this will be the most tender preparation, 1½ -3 minutes will be medium rare, still tender but good for those who don’t want to see blood in their meat. Once cooked to your likeness place meat in aluminium foil, wrap them to keep the heat and let it rest for 15 minutes. Remove from foil reserving he juices then thinly slice it across the grain, place in a serving platter then pour reserved juice on top then serve.